This Thailand gem of a tropical sanctuary explodes with blue, green, and turqoise. 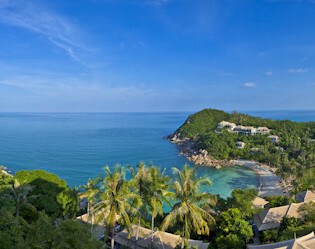 Live among the lush trees, lay out all day on the pristine beach, and snorkel in bright, beautiful sea. A tropical sanctuary awaits. Come into a universe where water meets sky and cascading terraces are fringed with hill coves and an unparalleled view of the Gulf of Thailand. 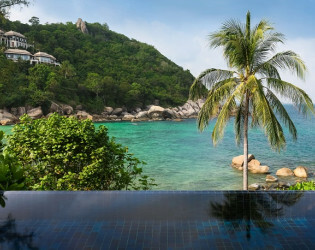 Swim within a blissful haven in Koh Samui. 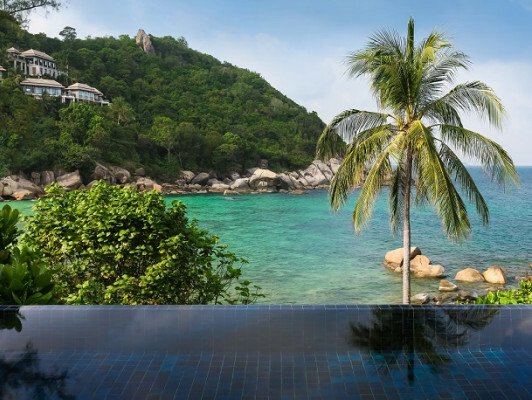 Surrounded by waters that invite, entice and serenade, Banyan Tree Samui is infused with a timeless air of delicious mystery. 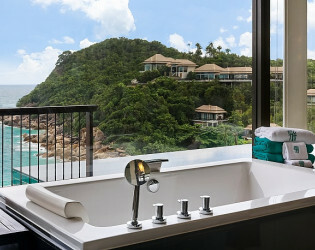 Overlooking the scenic Lamai Bay, this luxury resort in Samui, featuring elevated structures designed to reflect traditional Thai architecture, is nestled in a series of cascading terraces on a private hill cove in the southeastern coast of Koh Samui. Retreat from the dizzying pace of modernity into secluded haven where the hours melt into each other gently and peace is within your touch at all times. Wedding & Group venue and capacity information. 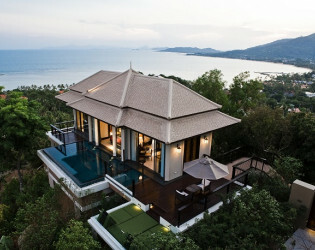 Rates are quoted in Thai Baht on per villa per night basis. Rates quoted are inclusive of daily buffet breakfast for single and double occupancies in one bedroom and four occupanies in two bedroom villa. 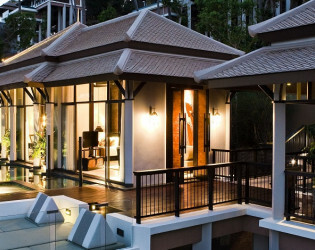 All villas are king-bedded, no twin bed available. CHECK IN TIME: 15:00 hrs. Guests may check into the hotel after 15:00 hours on the arrival date. Anyone arriving earlier than 14:00 hours will be checked in as soon as their villas become available. Requests for guaranteed early check-in will require reserving the villas from the night prior and a one (1) night charge will apply. CHECK-OUT TIME: NOON 12:00 hrs. - Until 18:00 hrs: 50% of group rate. - After 18:00 hrs: 1-night charge at the negotiated group rate. 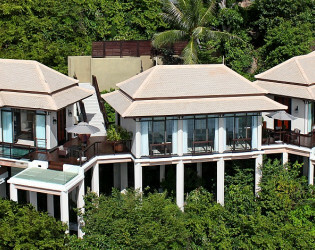 Each group busienss, room is based on a minimum of 10 villas minimum 2 nights stay is required. Deluxe Pool Villa (32 units): Extensive pool with designated swimming, wading and resting areas; comfortably-appointed double-vanity bathroom with rain shower and bathtub, outdoor lounge deck as well as open-concept bedroom and living area round off your deluxe In-Villa experience. 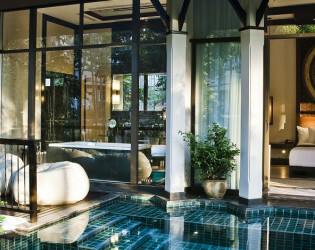 With a warm Thai décor harmoniously weaving the classic with contemporary and verdant private gardens surrounding the cocoon of your private villa enclave, be enthralled by the epitome of In-Villa style. 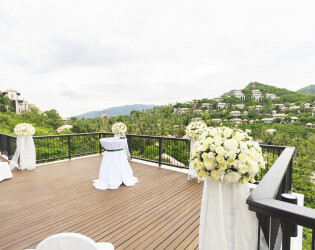 Partial Ocean View Pool Villa (11 units): Partial Ocean View Pool Villa is the perfect villa for your relaxing holiday on Samui. This eco-friendly villa features a magnificent infinity pool and spacious sun-lounge. Set amidst the jungle foliage with the sea in the distance, a quiet tropical setting offering respite from the tropical sun awaits. Fall under the spell as fresh sea breezes permeate the air. Ocean View Pool Villa (10 units): Stunning views of the windswept ocean, open-concept villa living seamlessly connecting villa quarters with manicured natural surroundings, an expansive pool with spacious swimming and dipping areas as well as a water lounge, warm contemporary Thai décor and natural light dancing across welcoming living spaces bring you to a level of peace and satisfaction known only to a privileged few. Admire views of nature while taking a leisurely dip in the pool or flip through channels – the choice, as always, is yours. Horizon Hillcrest Pool Villa (9 units): A lofty view of the sweeping landscape from high above the ground, extensive outdoor lounge, sky-suspended swimming pool and open-villa living quarters filled with warm, fresh air and steeped in natural light bring new meaning to the phrase "Bird's eye view". With a designated villa host and the option to enjoy a lavish In-Villa al fresco barbecue dinner, the sky is the limit – and just barely. 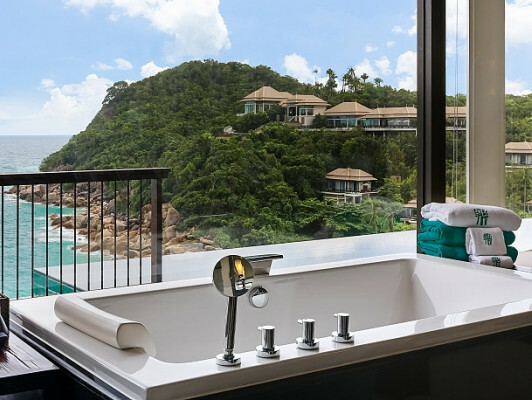 Royal Banyan Ocean Pool Villa (9 units): Set like a jewel on the loft of the resort, these Royal Banyan Ocean Pool Villas are the only units that offer unobstructed ocean views from the generously-proportioned living area. 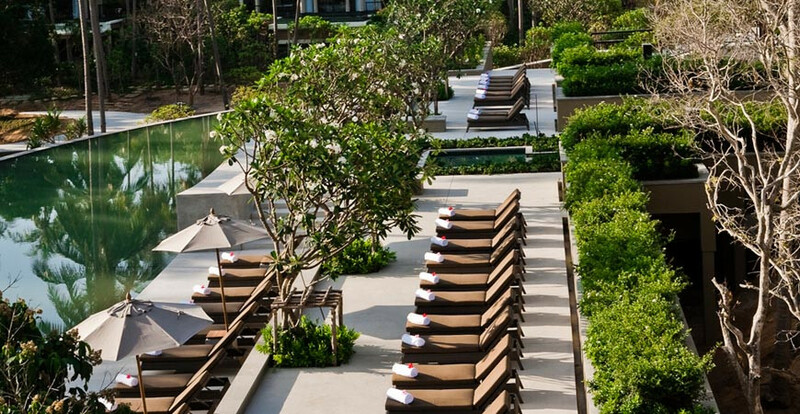 Refresh in the cool waters of your infinity pool or soak in the warmth of the adjacent jet pool. Book a yoga session in your private sala while watching dawn break over the horizon and, come evening, enjoy a candle-lit dinner beneath a moonlit sky. Family Ocean Pool Villa (14 units): The perfect luxury choice for families with children or for a group of friends. The Family Ocean Pool Villa offers two bedrooms commanding breathtaking views with a spectacular sunrise. Feel the warmth of sunshine dancing on your skin on your spacious sundeck. An infinity pool with a jet pool overlooking uninterrupted panoramic ocean views provides the perfect setting to enjoy in the company of those closest to you. 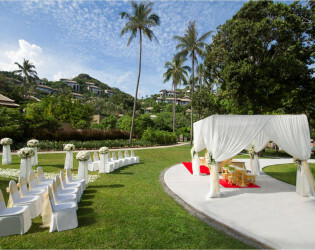 Enter the realm of cherished love in the sphere of magical surroundings overlooking the Gulf of Thailand. 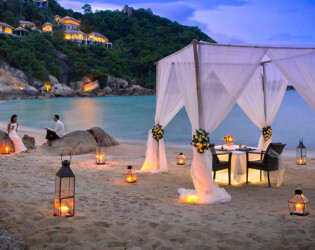 Come to Banyan Tree Samui and embrace love within the tropics. 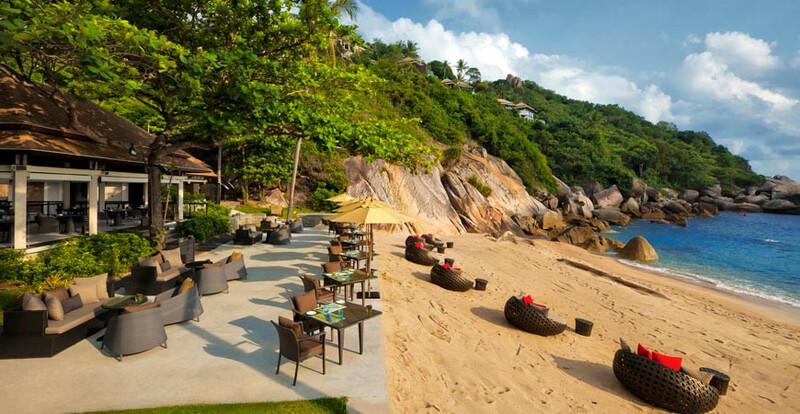 Warmest greetings from Banyan Tree Samui, the ultimate tropical holiday escapade, complete with utter relaxation and rejuvenation. 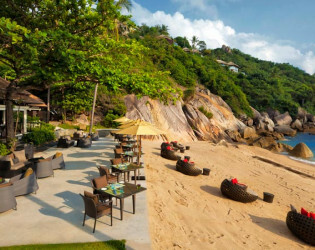 Overlooking the scenic Lamai Bay, the resort is nestled in a series of cascading terraces on a private hill cove in the south-eastern coast of Koh Samui. Choose to unwind in the comforts of your Koh Samui pool villa, amuse your palate with the culinary adventures provided from our dining outlets, partake in the range of recreational activities, indulge in the tender touch of the therapists at our award-winning Banyan Tree Spa in Koh Samui or soak away your worries in The Rainforest, our exclusive hydrotherapy facility, Banyan Tree Samui is your true Sanctuary for the Senses. 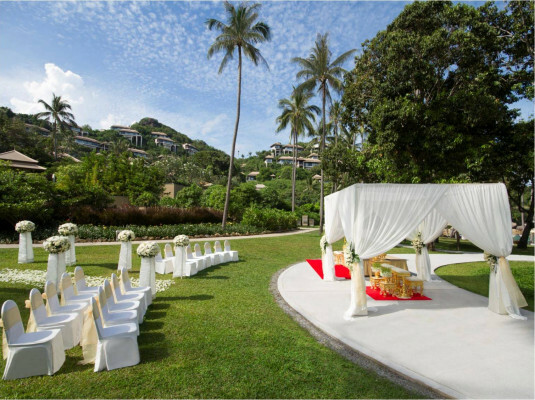 Poised to deliver intimate, tailor-made weddings set against the backdrop of scenic Lami Bai, or comfortable, high-level functions for groups of any size at our state-of-the-art Events Centre, our team of Romance and Event specialists is on hand to take care of your event needs. 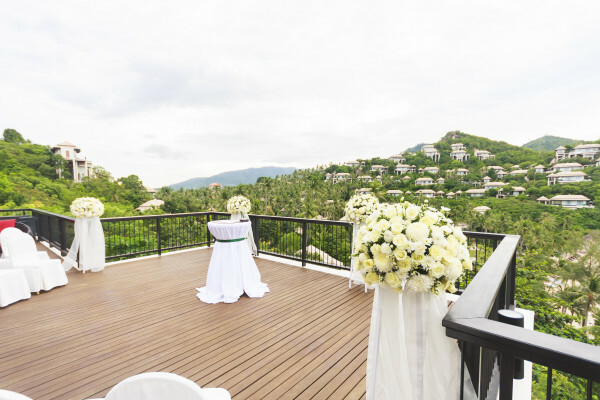 Beyond our secluded haven, lies an abundance of excursion options for both couples and families alike, including a variety of cultural attractions as well as the idyllic natural beauty of Samui's jungles and the breathtaking beaches, islands and coral reefs of the Gulf of Thailand. Exquisite dining coupled with eclectic shopping makes for another way to explore the diverse offerings of this modern island that still retains its rustic charm. 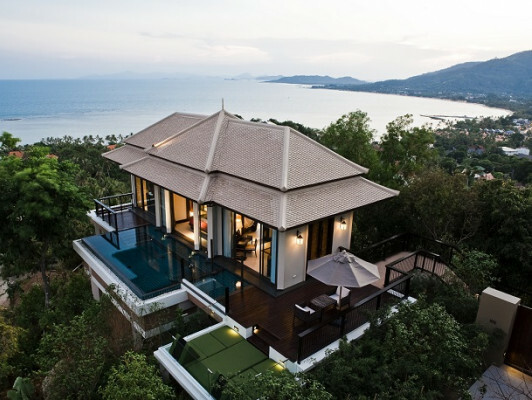 From couples, families or groups to comfort-seekers or adventure-seekers, tropical splendour awaits at Banyan Tree Samui. 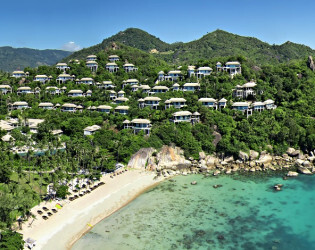 Thank you for considering our destination and I look forward to having you as our guest at Banyan Tree Samui. Indoor and al fresco seating overlooking the entire resort and beach promenade, The Edge displays a sumptuous array of international food for breakfast and lunch alongside a delicious à la carte menu. The smorgasbord of Asian and Western offerings includes variations of tempting local dishes featuring the freshest, most seasonal ingredients. Fresh seafood and prime cuts of meat presented at your table in an intimate beachfront setting, a choice of char-grill, a wood-fired meal or rotisserie. 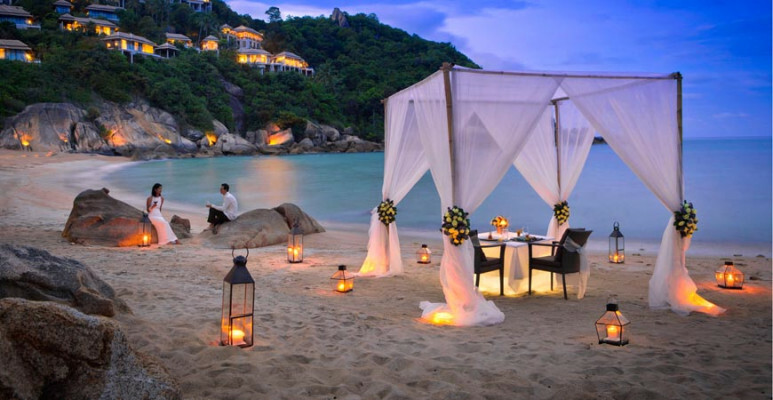 The soothing lap of ocean waves by your side blend into a gloriously singular dining experience. A unique dining experience to be savoured even by the most well-heeled of travellers, this dinner experience will steal itself into your soul with a plethora of uniquely blended elements: Excellent ingredients simply and stunningly; a tented private dining pavilion set on the beach; an expansive view of the vibrant Gulf of Thailand The Samui Episode promises to intrigue, to scintillate, and give you an experience to remember forever. A modern atmosphere for quiet mornings or leisurely indulgent afternoon tea, the lounge also provides Thai and Western tapas and a selection of signature cocktails – including mixes unique to Banyan Tree. 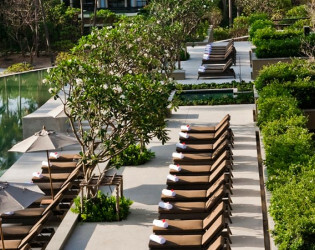 A selection of healthy sandwiches, extensive juice selection and an innovative list of carefully created cocktails formulated specially by Banyan Tree mixologists await you at the Pool Bar. Overlooking the pool, gardens and sandy beach shores, the bar also provides a daily choice of afternoon treats, including a fresh surprise specially created by chef daily. Tropical sanctuary overlooking the clear ocean water. Kick off your shoes and enjoy the lounge. Infinity pool overlooking the ocean.